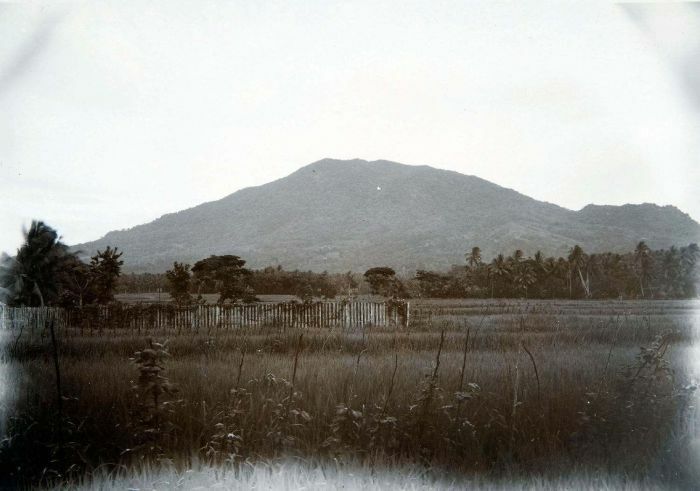 After Gunung Halimun which borders West Java, Gunung Karang is the highest peak in Banten. There are two separate trails on the mountain both of which can be done as half-day hikes. 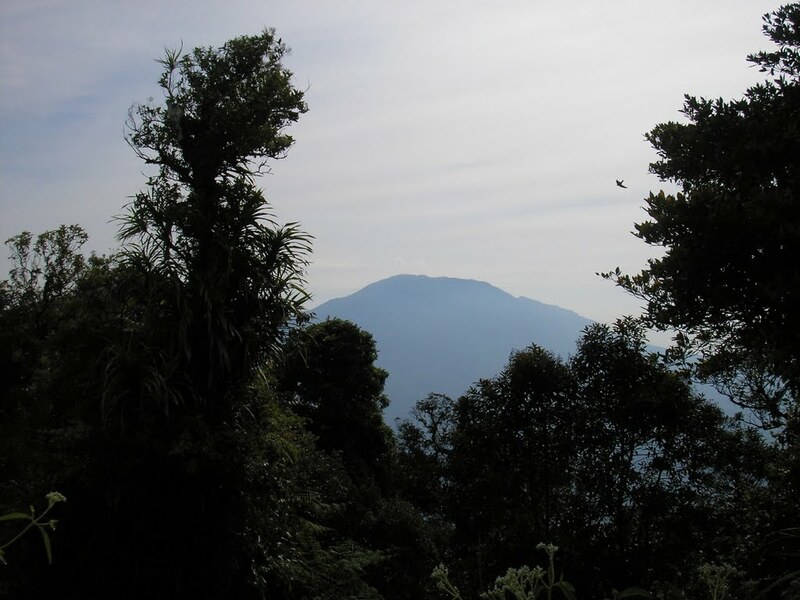 The first leads to the forested summit with a mosque on top, and the second leads to a rarely-visited crater area. 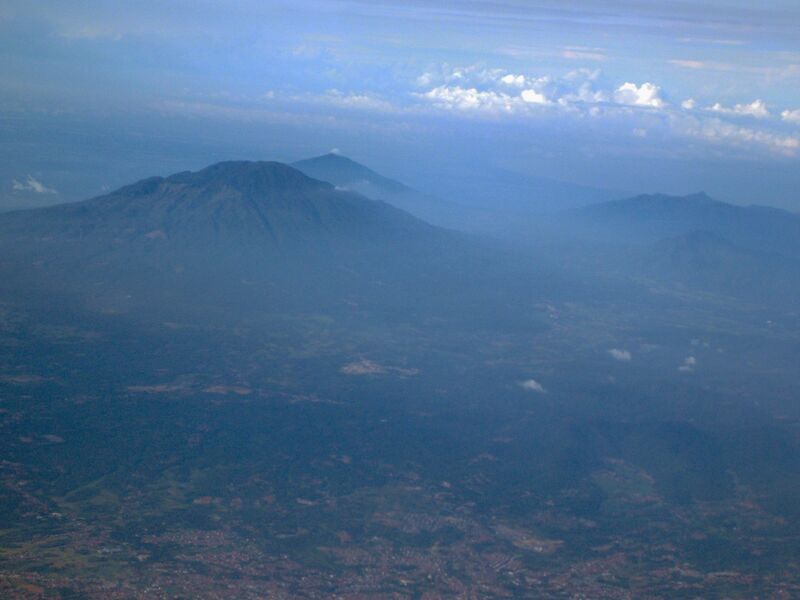 Given how close Gunung Karang is to Jakarta it is surprising that it is not yet as popular as similar peaks in West and Central Java. Whilst the mountain does not offer much in the way of views due to it being forested, both trails are really worthwhile days out. 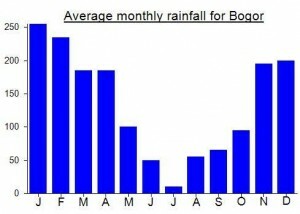 It is often hazy in Banten, quite possibly due to pollution from Jakarta, so the best time to visit might be the end of the rainy season or start of the dry season (ie. April and May). 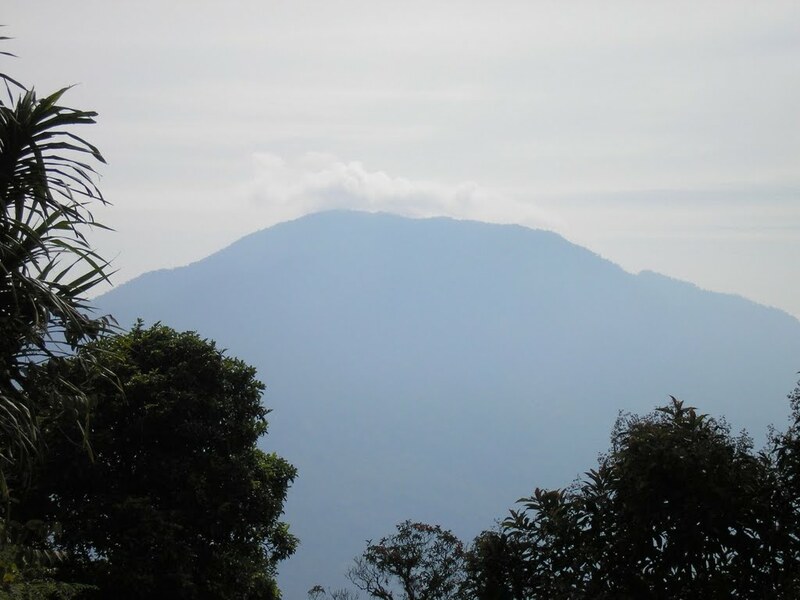 The trail to the summit starts in the large village of Kaduengang (845m) which lies roughly east-northeast of the peak. It takes about 25 minutes by motorbike or car to reach the trailhead from the nearby town of Pandeglang but you will probably need to ask for directions as there are a couple of places where you might take a wrong turning. From the trailhead, a clear plantation path leads up the hillside between fields of, amongst other things, onions. Pos 1 (1,150m) is a pleasant little warung selling drinks and simple snacks and has a nice seat made out of tree branches. Soon after (at 1,200m) is another simple wooden hut but this is not a Pos. 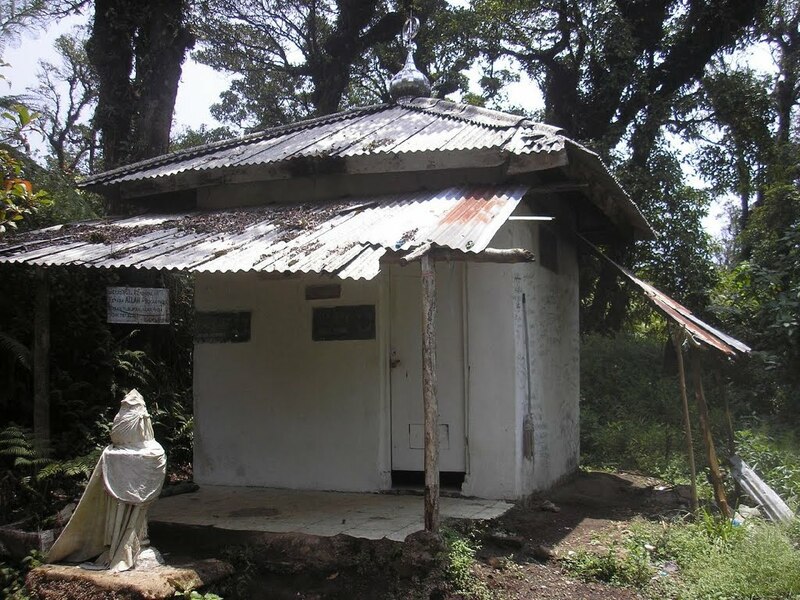 The next Pos is Pos 2 (1,330m) – another simple warung and also a favourite camping spot for local hikers on weekends. This is a good spot for photographs in the easterly direction. It should have taken you about an hour to reach Pos 2. Pos 3 follows at 1,375m (hot drinks available) before the trail leads into forest (1,400m) and the views are much more limited. The path remains clear but a little muddy at times and occasionally with steep drops on one or both sides. There are plenty of birds in the forest here, perhaps because it is not as popular with hikers as many other mountains are. The next major landmark is a ‘false summit’ (1,720m) which is where the trail leads steeply down to the left for around 30 metres before ascending again to the true summit. 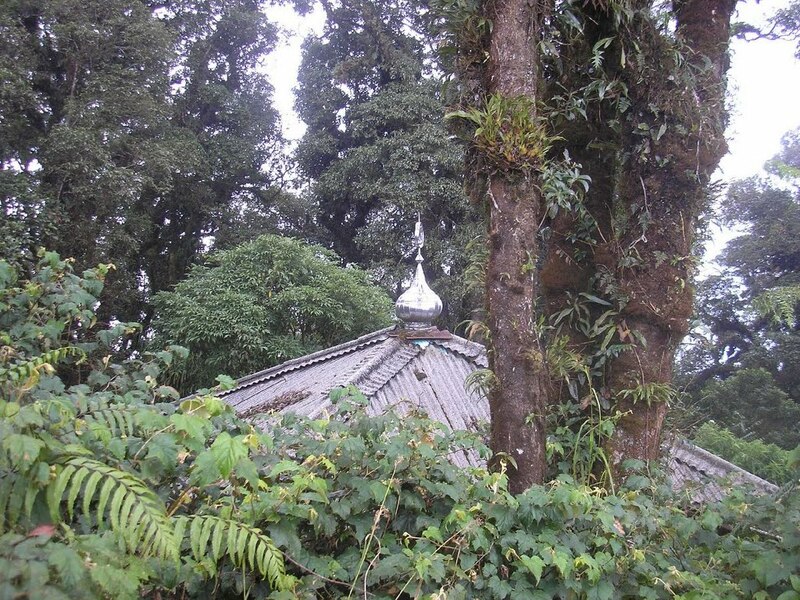 The summit is covered in forest and features various interesting building and monuments. First of all, there is a mosque which is regularly used by local pilgrims. There is also an ancient grave, presumably of an important local leader or religious figure. There are the usual summit signs nailed to trees. There are also pools of water with a fence around them. The summit is known locally as Sumur Tujuh (‘seven wells’) and these pools are some of those seven water sources. The views are very limited but there is one spot near the water pools where you can look down over the forest below. It should have taken you a little over 2 hours to reach the summit. To descend the same way takes a little less. Another interesting trail on the mountain leads up from Pasir Angin (685m), which is several kilometres south round the mountain from Kaduengang. This trail leads up to hot springs and a crater. Like Kaduengang, Pasir Angin can be reached from Pandeglang by car or motorbike in 20 minutes or so. Unfortunately it would appear that the two trails do not join up so it is not currently possible to do a circuit and each trail must be done separately. Whereas the trail to the summit from Kaduengang is fairly obvious most of the way, the trail up to the crater from Pasir Angin is much less well-used, narrower, steeper and slippery in places. There are also numerous junctions meaning that a local guide is essential for this one. You should have no trouble finding someone in Pasir Angin, as the trek takes a similar amount of time to the summit trek (around 2 hours up and less than 2 hours back down again). In very general terms, after the first couple of rights below 1000m, you need mostly left turns at junctions. Once again, views are best in an easterly direction before leaving the plantation area and entering degraded forest at around 1,170m. A tricky section is at what appears to be a usually dry stream (1,350m) where you need to take extra care not to slip on awkward terrain. The crater and hot springs can be smelt from a couple of hundred metres away. When you finally arrive at the edge of the crater area (1,410m) you are confronted with a large rocky area with sulphur gases billowing into the sky and hot, muddy bubbling pools. Surrounding this typically surreal view are steep forested crater walls. Locals sometimes take bottles of the water back down with them as the high sulphur content means it is good for skin complaints. Karang’s active crater is not circular in shape – more a large gash on the mountainside. If you look on Google Earth or Maps, you will see what appears to be a circular crater a few hundred metres north of this one. 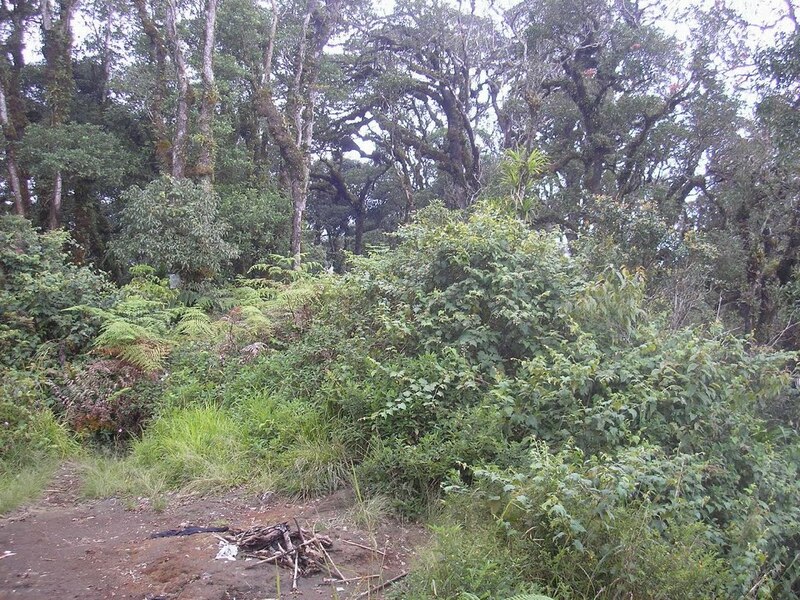 To the best of our knowledge, this is a swampy, dormant crater with no present activity, though it may be the spot where the medicinal cool spring is to be found (see John Hargreaves’ comment below mentioning a 7–hour round trip from Pasir Angin to a spot at 1,600m). Strong hikers should make it back down from the crater to Pasir Angin in under 2 hours, where ojeks can be arranged back down to Pandeglang. Getting there: By car from Jakarta: Take the toll road to Merak. Exit at the Pandeglang turn-off and head into the town centre. Take a right up Jalan Gunung Karang and follow it to either Kaduengang (for the summit trail) or Pasir Angin (for the crater trail). There are buses from Jakarta to Serang, and angkots onward to Pandeglang. As of 2016 you can also now take the frequent Jakarta commuter line trains to Rangkasbitung (just Rp8,000, two hours) and then an ojek from there to Pandeglang. Accommodation: Limited accommodation available in Pandeglang – Hotel Rizki is probably the best as it is large and friendly and has a restaurant. A wider range available in Serang, Anyer and Carita. Permits: None required but take a photocopy of your passport photo page just incase. You are advised to take a local guide with you, expecially for the Pasir Angin trail to the crater. Water sources: Drinks available at Pos 1, 2 and 3 on the summit trail. Spring water available at the summit itself but stagnant so best take sufficient supplies. On the Pasir Angin trail to the crater there are a couple of streams but much better to take enough drinking water with you. Banten, Featured Kurang Tinggi. permalink. 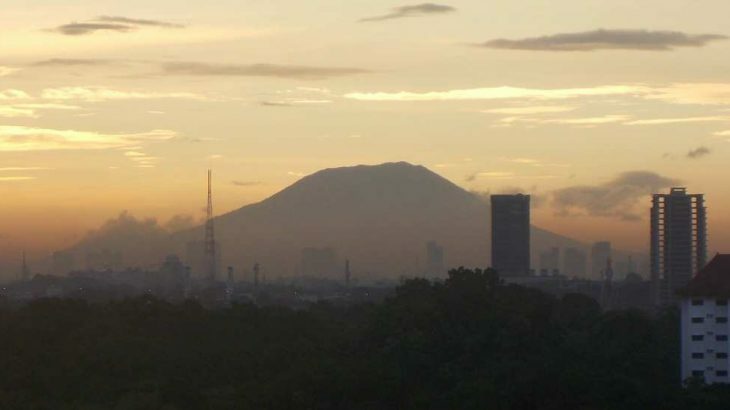 Well, this is a gunung I can sometimes see from my apartment in Jakarta. 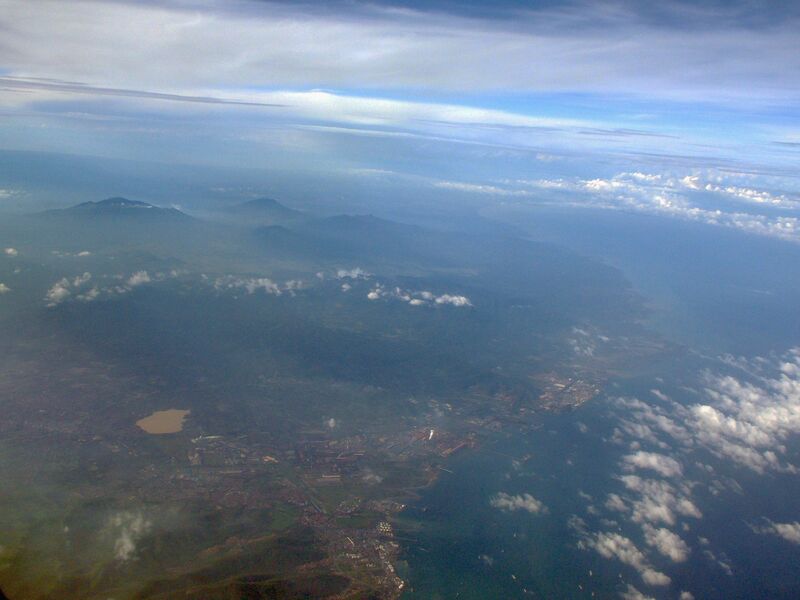 Whereas those with a southern view can gaze at Salak and Gede Pangrango, I get a view west to Banten. Pollution and haze normally prevents a decent sunset but occasionally you get great visibility and a brilliant view west. 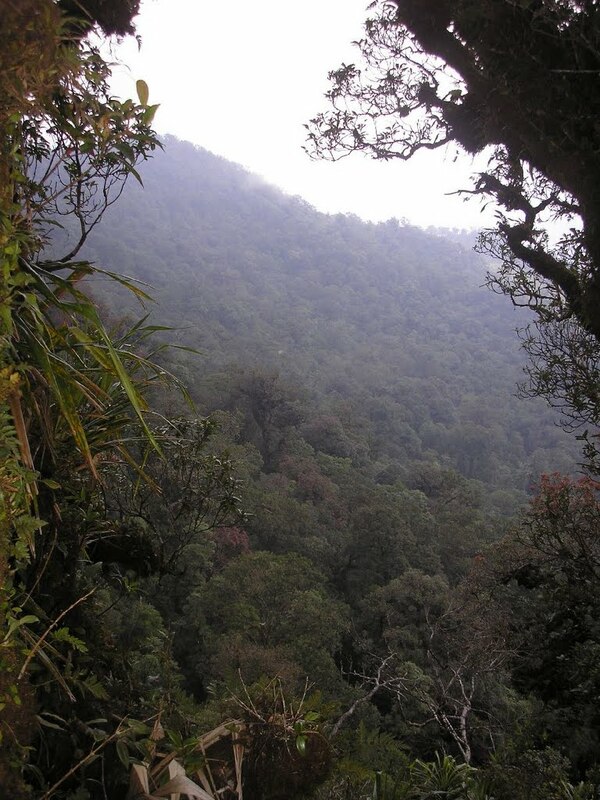 Having last climbed Karang in 2009, just as the Gunung Bagging project was getting started, I thought it would be worth going back and improving the original, rather limited, write-up, plus making a visit to the crater too which has long been on my list. Now that the commuter line runs all the way out to Rangkasbitung (thanks Ahok – a man who worked harder than most Jakartans can bring themselves to recognize) and costs only Rp8,000, I thought I would give it a go. Things got off to a surreal start at Pondok Ranji train station when tens of thousands of flying ants suddenly inundated the platforms! The train was crowded, so expect to have to stand for up to two hours (that’s how long it takes from Tanah Abang to Rankasbitung). There are plenty of angkots running between Rankas and Pandeglang but given the choice between cramped, sweaty, noisy, continually-stopping vehicles and a breezy ojek ride I opted for the latter. Gojek would be even better but not currently available from Rangkasbitung (getting back is another matter though). Hotel Riz / Rizki is a large complex on the main Pandeglang-Serang road and is basic but adequate and friendly, with a reasonably good restaurant too. The next day I got a gojek up to Kaduengang for a bargain Rp20,000. Alas, one major issue with gojek is that you can often get an ojek from point A (a large town) to point B (an obscure village) easily enough but be unable to order one back. Anyway, there were a few folk on the trail up to the summit – especially campers at Pos 2, but compared to the huge changes in terms of number of weekend hikers on other mountains in Java, Karang appears to still be something of a local mountain – hikers were mostly from Cilegon, Serang, and so on. There were also pilgrims, perhaps wanting to bathe in the spring water at the summit or pray for something or other at the summit mosque. Some of these folk were dressed quite formally, wearing peci and so on. I took a guide from the trailhead, an old chap who smoked continually yet was phenomenally strong. I could have managed alone given how good the trail is, but it’s always nice to contribute locally (though most of it probably got spent on cigarettes!) We were at the top in 2 hours. A view of Krakatau would be great, but the little break in the trees is probably not looking in the right direction anyway – Pulosari a much better bet for this. We were back down in 90 minutes, including a short chat with a friendly Dutch chap who had taken his golden retriever up with him! I got an ojek back down to Pandeglang for Rp40,000. The following day. Gojek came up with the goods once again -a Rp17,000 ride up to Pasir Angin for the separate hike to the crater of Gunung Karang. Pasir Angin is not named in the Gojek app (except in wrong locations) so I had to guess the right point further south of Kaduengang but roughly due west of Pandeglang and where there was a sign of a road up to 700m or more. Luckily I guessed correctly. It took us about 20 minutes to get there, along roads a bit bumpier than the one to Kaduengang. No trouble finding a villager to take me up to the crater – Kawah Haji, they call it apparently. Some sources suggest there is a second crater called Kawah Welirang but this may be referring to the same spot or even the cool spring at c1600m that JH mentions in the comments below, though Welirang (sulphur) is a good description of this smoky crater with hot mud pools. Very few hikers come up here presently – even the local who was my guide took me the wrong way for part of the trek. There are loads of junctions so it would be madness to try without local help, or at the very least my GPS tracks. Some slippery bits and a couple of small (hard to detect) leeches on this side of the mountain, and the GPS had a lot more difficultly retaining a decent signal. The crater was much as expected… a smaller version of Pulosari. Not bad, and deserves to be better known as I’m sure the locals in Pasir Angin would be delighted at the opportunity to make a bit of extra money for taking visitors up to what is really their back yard. There is currently no sign for the crater, and locals were surprised to see a white chap arrive on a motorbike at 630am. The kids looked shocked/amused and probably wondered why I looked like I had no skin! The weather was not ideal, but I imagine under clear blue skies you could get some pretty atmospheric photos of this spot. As with the trail to the summit, it took 2 hours up and 90min down. Similar ojek price back to Pandeglang (i.e Rp40,000 should be sufficient). For those using cars, there is definitely space near the Kaduengang trailhead. For Pasir Angin, you might have to leave your car a couple of hundred metres away at a wide junction or something so that it doesn’t block access. For getting back to Rangkasbitung I was able to get a Gojek for Rp44,000 (gave him Rp50,000 which is still a very good price for 21km). Then back on the train and off to Ya Udah Bistro for soup and pretzels. A decent couple of days out of the city. 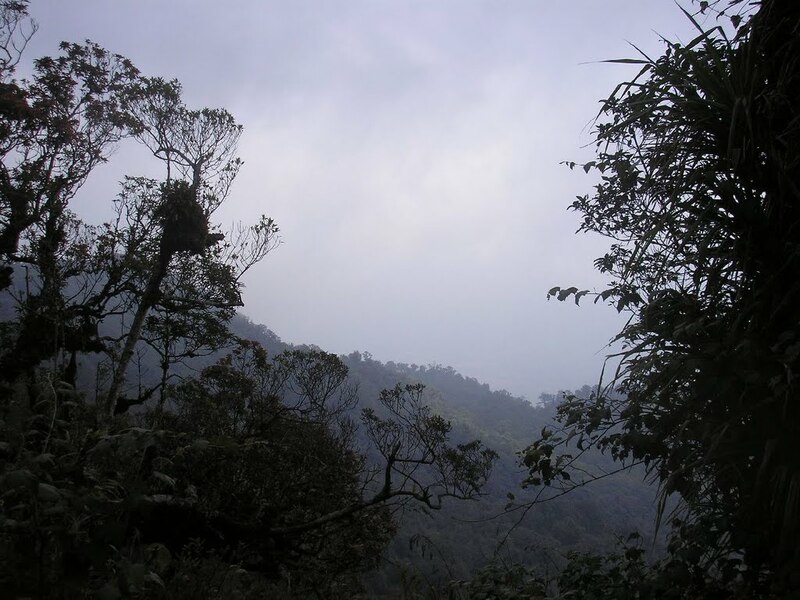 Will hike Aseupan next year sometime (this region’s third peak after Karang and Pulosari). Do you have to pay at the first checkpoint to go to the summit ? They asked me 50.000 rp ! Doesn’t surprise me. Is it ‘official’? I suppose if they give you a ticket of some sort them it is at least half-official. I very much doubt local hikers pay this much – so it’s probably just the traditional Asian welcome for foreigners of expecting money from you! I climbed Gn. Karang on Sunday. The road to Kadoengang is quite good now. Any car gets there. The trail is straightforward. It is impossible to lose the right way. Four hours are for very slow hikers. I needed two hours, small breaks included. It is a nice short tour without any difficulty (besides the typical problem of very slippery ground during rain). The 1st Peak Mountain in Banten Prov. I’ve reach. Next Karang Mt. for 2nd peak in Banten. We climbed Gunung Karang on Sunday November 13. Together with two Jodys (ladies, that’s dua orang bernama Jody, not dua laki jodoh) we set out by car at 4 am from Jakarta, early enough to start the hike by 6.30 am. Note that when you reach the clock tower at the alun alun in Pandeglang, you cannot directly turn right because of the one way system; you must loop around the alun alun first and then jink into Jalan Gunung Karang via the smaller road on the west side of the square. A kilometer or so out of Pandeglang, you reach a fork; be sure to go right. There’s a T-junction right in the center of Kadu Engan, where you turn steeply uphill through the village. You could park here or even at the top of the village by the telecoms mast. From here the route was as described by Andy- WSW past a small musholla as you exit the village, curving right to bear north about a kilometer above the village and then cutting back WSW. There are farm huts and even a small warung among the vegetable fields, which reach as high as 1350m. 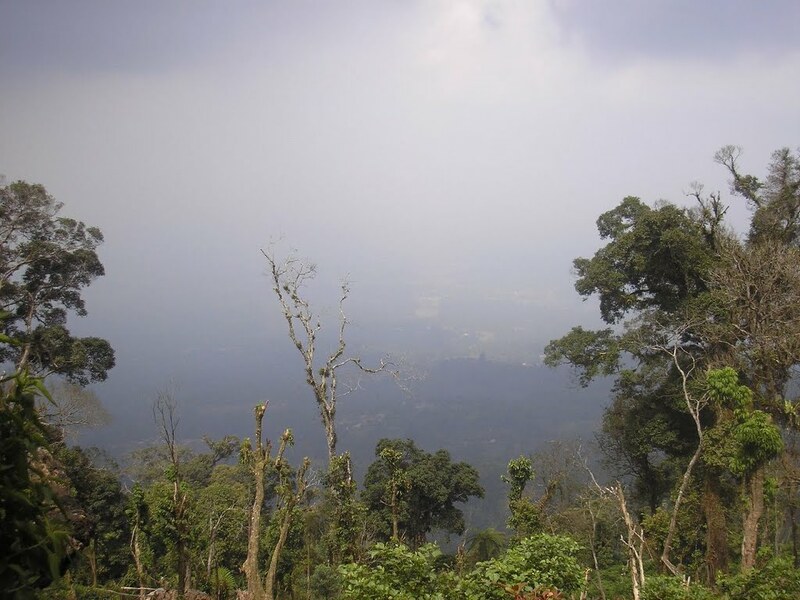 Enjoy the views across the Banten plains from here- there might not be any view at the top! The “false summit” is at 1720m, where you turn left to descend into the ravine before climbing again to the true summit. We found the hike fairly straightforward, not too slippery, with minimal need for hand supports. (The climb to the cool springs from Pasir Angin is more taxing, and also requires a guide.) Cloud cover was light but enough to obscure the view. An overnight camp would improve the odds of a clear view, but trees would block some directions anyway. Our ascent time from Pasir Peuteuy was 4 hours, but only 3 hours from Kadu Engan. Descent time was 3 hours including a couple of long rain stops in the farm huts. This is great information. I am planing on hiking up the mountain later on in May. Beside driving up Tanguban Perahu this will be my first trek up a mountain in Indonesia. 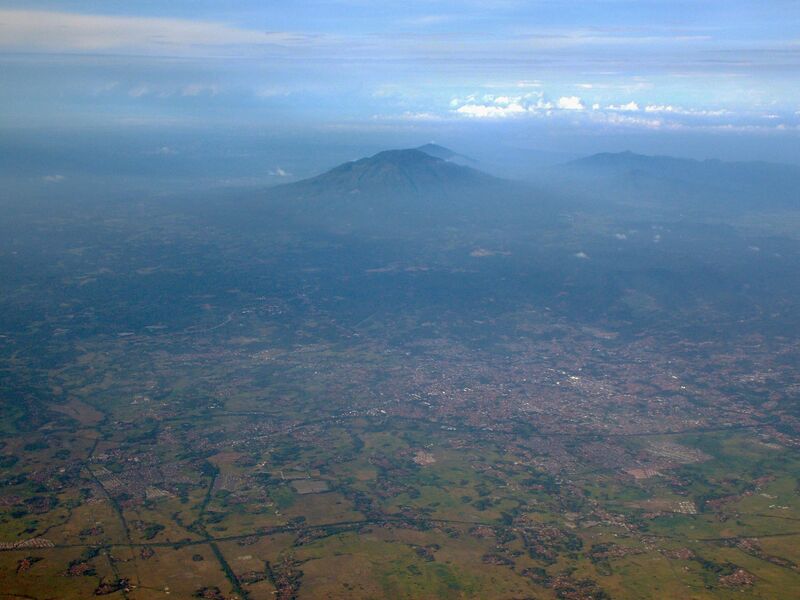 I hope to hike up a number of other mountains in West Java and Banten. I don’t have much information on doing this so this site is a huge help. I checked my GPS tracks from the hike. After battling to the summit with a big detour, we descended the right way. The route up should start from Jalan Gunung Karang at lat -6.2592, long 106.0752. From there you hike pretty much straight uphill through the kampung in a west-southwest direction. The trail takes a small deviation (dog leg) northwards about 1 km from the kampung, but then quickly continues back west-southwest. It’s not an amazing hike; but if you get to the summit before the clouds and rain come, maybe you can see Krakatau, which would be worth it. Our mistake was launching from Kampung Angin Pasir at 6°17’31.02″S 106° 4’8.23″E and striking out NW from there on a line directly to the peak. The Kawah Haji hotsprings are at 6°16’45.25″S 106° 3’13.96″E which was our dead end. Thanks for the GPS points and yes, that is the jump-off I tried to describe as the best route for a successful climb – next time, eh! Hi Keith, it’s funny how the smaller ones tend to be the difficult ones. I wish I could offer more specific advice but we got lucky even finding the trail on the way up after stumbling around farmland and through thick forest. On the descent, the path lead down to a village (according to one signpost, Kampung Baru) and from there we took a right and followed the track back round the (eastern) side of the mountain to where we had started. I do recall on the way up there was a fork in the track and we went left (higher) which was a mistake – though we never came across the hot springs. The correct approach for the route we came down is from the ENE rather than the SE.